Welcome to the tropical island of Grand Cayman, where you’ll find pristine white-sand beaches and numerous Caribbean-flavored tourist attractions. Grand Cayman is the largest of the three Cayman Islands and is host to the capital city of George Town. 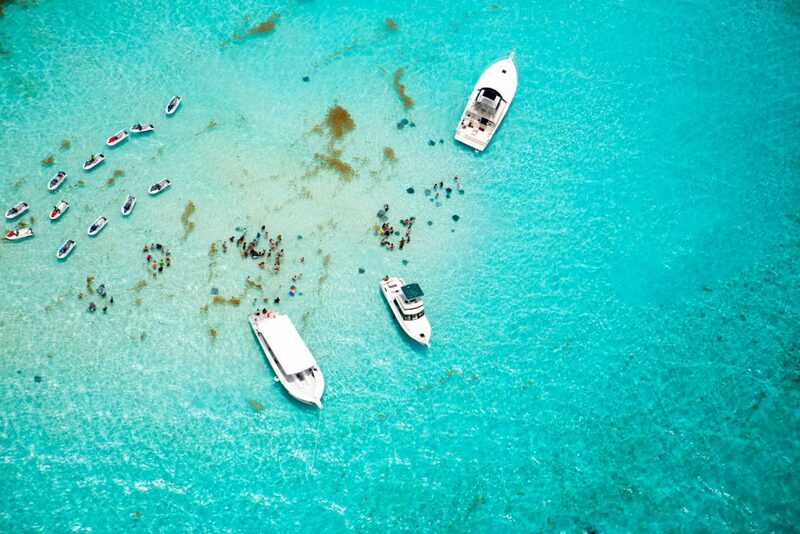 Before you set sail for your tropical island under the sun, let’s first make sure you know the inside scoop on everything there is to do, see and taste while visiting Grand Cayman and neighboring islands. Soaking up the sun, surf and sand at one of Grand Cayman’s breathtakingly beautiful beaches is the most popular thing to do. No harsh-crashing waves, no rocks, just beautiful palm trees, warm crystal-clear water, and a cool ocean breeze. It’s the perfect place to relax, get some sun, and let the worries of the world drift away. Our favorite beaches in Grand Cayman include: Seven-Mile Beach (Westin Grand), Spotts Beach, Rum Point, Kaibo, Smith Cove, South Sound/Sand Cay, and Starfish Point. If there’s one thing you absolutely have to do while visiting Grand Cayman, its touching the string rays at Sting Ray City. The northwest corner of Grand Cayman’s North Sound is home to about 50+ sting rays that weigh around 150 lbs and measure up to 5 ft. wide. Visitors can touch and interact with the sting rays without worry of getting stung. It’s a unique experience, rated by National Geographic as a must-see experience that should not be overlooked. Rum point is a hidden gem on the island that’s more of a stay-cation destination, and a local favorite for many Caymanian residents but, if you get the chance to venture out that way, it’s definitely a site to see. Perfect for kids who want to swim in the shallow waters, while adults have access to some of the best beach bars on the island. Have a free afternoon or evening? Head on over to Camana Bay for some luxury dining and souvenir shopping. There’s also a splash pad for kids to enjoy, and you can watch after them while enjoying a delicious meal at one of the incredible restaurants located right by it. For all the romantics out there, this activity is for you. Slip into something dressy, let your hair down and sail off into the sunset with the love of your life. It’s a great chance and a different way to see the island while also enjoying beautiful music and ocean views. See this sunset cruise options here. These are just some of the amazing attractions you’ll experience on the beautiful island of Grand Cayman. Should you want more insider tips, stop in at our Cariloha store and ask our friendly staff for more details and recommendations. They’ll point you in the right direction to make your vacation to Grand Cayman even more unforgettable.